Designed for use in virtually all golf course, sports turf and landscape applications, the patented WaterWick gravel injection system dramatically improves drainage without disturbing the soil surface. The WaterWick system is fundamentally non-invasive so in most cases the treated area is immediately ready for use. 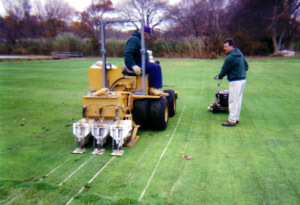 WaterWick effectively solves drainage problems on golf greens, fairways, tees and approaches as well as a wide variety of professional and amateur sports fields, lawns, parks, and turf-grass parking areas. The WaterWick innovative 3-point hitch system is designed for use on tractors with at least 35 horsepower. The base unit features a vibratory plow that utilizes its own hydraulic pump, tank and controls. 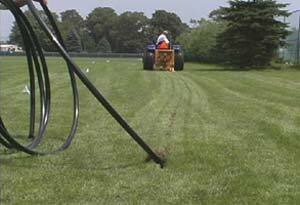 Several easy-to-mount attachments allow the operator to efficiently dig trenches up to four feet deep, neatly pull pipe up to two inches in diameter, lay wire or install drainage with the patented WaterWick gravel injection system.